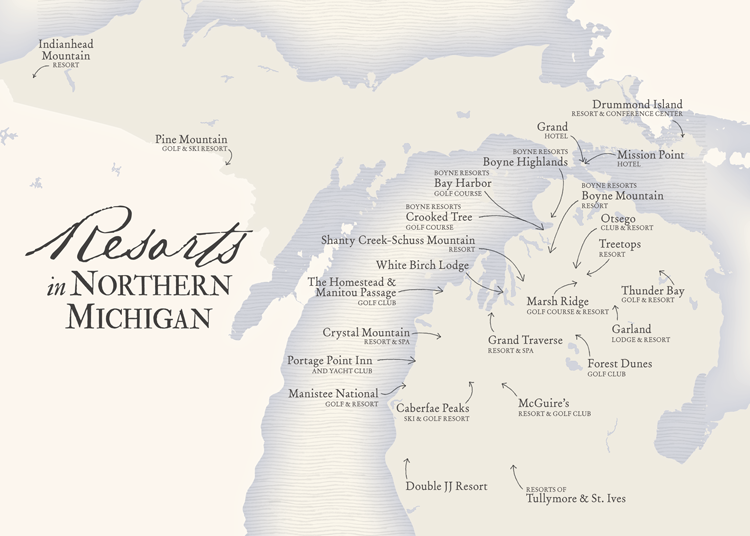 Anyone looking for a sign that the state’s moribund economy is perking up should check with golf and ski re-sorts in northern Michigan, which are investing millions of dollars in additions, renovations, and new amenities. The biggest story may be the revival of the Garland resort, which was taken over by new owners last fall. The rejuvenation efforts at Garland continue this spring, as a renovation of the massive log lodge and golf club in Lewiston seeks to restore the luster of one of the state’s ionic recreational attractions. With a new name, Garland Lodge & Resort, and expensive upgrades and amenities like a new spa, the 3,000-acre resort is even more glamorous now than it was during its glory years, when it was the only resort in the Midwest to earn a four-diamond rating from AAA of Michigan. With everyone competing for family and female spending power at resorts, the 8,000-square-foot spa and fitness center was one of the first major additions approved by Garland’s new owner, Gerald Forsythe, and his Auburn Hills-based New Frontiers. Forsythe brings very deep pockets to his plan to move Garland forward. His Indeck companies, based in Wheel-ing, Ill., are North America’s largest privately owned supplier of emergency and backup steam-generating power. The company owns 17 fossil fuel, hydroelectric, and biomass power plants in the U.S., Canada, Guatemala, and the United Kingdom. Although Forsythe’s business bona fides are well-established, he’s better known for his long involvement in Indy car racing. His Forsythe Championship Racing was a dominant team with star Canadian drivers Paul Tracy and Jacques Villeneuve, who won the Indianapolis 500 and was a Form-ula One champion. Forsythe also owned auto-racing circuits in Toronto, Canada, Mexico City, and Monterrey, Calif.
Forsythe’s purchase of Garland is his second major investment in a northern Michigan resort. New Frontiers supplied the financing to build the Mountain Grand Lodge and Spa & Avalanche Bay indoor water park at Boyne Mountain Resort in Boyne Falls. Architect Mike Benkusky, who designed Forsythe’s Canyata golf course in southern Illinois, was brought in last fall to spiff up the Garland courses. The Double JJ Resort in Rothbury is undergoing $3 million in improvements. Photograph courtesy of Double JJ. Some redesign work and upgrading of the bunkers on the Fountain course has already been completed. Work on the other three courses is under way. Benkusky will also oversee the development of a fifth course that was started but never completed by the former owner, Ron Otto. That new course will be open for play in 2011. Another makeover is being unveiled in Gaylord, at the once daily-fee Loon golf club. Since its debut in 1987, The Loon depended on league play and play-and-eat bargain gimmicks like fish frys and steak dinners to fill their tee sheets. This year it’s going big-time with a new name, The Loon Golf Resort, and upscale lodging in 11 new townhouses — each with four bedroom suites, flat-screen televisions, and WiFi Internet access. The townhouses were designed strictly for golf groups and are not part of the resort’s real estate inventory. The resort’s profile in the golf world will also get a huge boost by its new affiliation with famed teaching guru Butch Harmon, as well as LPGA player Natalie Gulbis. The Loon will be the permanent home of the three-day Butch Harmon Golf School, and Harmon (who counts Tiger Woods and Phil Mickelson among his students) will be at the resort July 30–Aug. 1 as part of a pro-am tournament. A new practice facility to accommodate Harmon’s video teaching techniques will also be ready this season. Gulbis will spend time at the resort hosting two tournaments and clinics in August and September. With a nod to the economic times, as well as competition from nearly two dozen courses in the area, Preuss says prices will remain at last year’s levels. “Our goal is to position the resort as a great value for championship golf,” he says. Another Gaylord resort that took a major step forward this winter as a world-class destination is the Otsego Club & Resort. Its owner, Osprey Investment Co. of Brighton, spent several million dollars remaking the old blue-blood private ski club into one of the nation’s top snowboarding parks. The club has two 18-hole courses, the Classic and Tribute. Last winter, 10 Olympic snowboard teams from as far away as Australia, New Zealand, and Japan traveled to Gaylord to train on Otsego’s new 22-foot half-pipe, the same setup used for the 2010 Winter Olympics in Vancouver. Osprey’s investment paid off after the Games, as some of the athletes — including the United States team — returned to the club to train for the U.S. Snowboarding Open, which was staged at Stratton Mountain, Vt., in March. With its upscale, renovated rooms and facilities, and its relatively wintry isolation, the Otsego resort could become a permanent training base for these world-class snowboarders. Moving to mid-Michigan, work continues at the Resorts of Tullymore & St. Ives in Stanwood, where developers Peter J. Ministrelli and his nephews, Ronald, Richard, and Robert Marino, are still bullish on their “if we build it right, they will come,” philosophy. With $50 million already committed in transforming two rural golf clubs and a 44-room inn into a world-class resort village, the family is moving ahead on a five-year development plan that could see them invest another $50 million, depending on growth and sales. Using their own money and resources from their Troy-based construction and earth-moving businesses, the developers reconfigured the award-winning Tullymore golf club and 800 acres around it into distinct residential villages. That includes the addition of upscale single-family homes, condominiums, and an ultra-luxury Residence Club that allows owners who buy fractional ownership of a unit to vacation at similar clubs around the world. This summer’s major project will be the construction of an energy-efficient spa and fitness facility with an accompanying child-care center. Expected to cost around $1.5 million, the facility is set to open in 2011. Meanwhile, Richard Cole-man and his Progressive Resorts group relied on impeccable timing to acquire the $33-million Double JJ Resort out of bankruptcy last year for $11 million. Located in Rothbury, north of Muskegon, the resort includes a 1,200-acre dude ranch, a $17-million indoor-outdoor water park, an 18-hole Arthur Hills-designed championship golf course, a restaurant, condominiums, and a collection of ranch buildings, bunkhouses, chow halls, and bars. The Double JJ, which opened in 1937 as the Jack and Jill dude ranch, was most recently owned and operated by Bob and Joan Lipsitiz of Bloomfield Hills, and investor Wally Wojak. 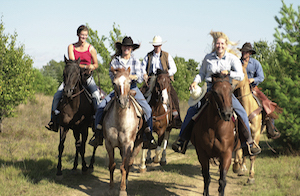 Over the past 15 years, they built a loyal clientele that was drawn to the ranch’s real Western flavor, featuring authentic cowboys from Wyoming and Texas and weekend rodeos. 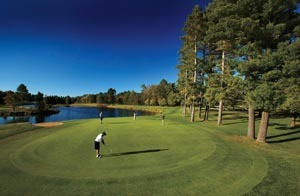 They widened the resort’s appeal by adding the Thoroughbred Golf Club and upscale condo lodging suitable for golfers. In 2006, they took the resort to an even more expensive level when they opened the Gold Rush indoor water park and kicked off a campaign to sell condominium properties tied to the golf course and water park. Then the Great Recession crushed their dreams. On July 14, 2008, the resort filed for bankruptcy, smothered by $20 million in debt — mostly the $17.5 million construction loan for the water park, according to court documents. What’s more, some $11 million in condominium sales dried up when buyers couldn’t finance their purchases. Last June, Progressive, with Coleman as their point man, bought and reopened the resort after it had been closed for nearly a year. Progressive Resorts is the Michigan entity for two Pennsylvania companies, American Resort Management LLC and Heritage Hospitality LLC. “There aren’t many places in the Midwest — or in America — where you can take not only your family, but many families at the same time, and find accommodations that fit every pocketbook,” he says. All of the facilities were reopened last year except for the original ranch, which needs extensive renovations (they’re scheduled to be completed this year). The group is spending $2 to $3 million over the next 12 to 14 months in capital improvements. “It wouldn’t be hard for us to spend anywhere between $10 and $20 million over the next seven to 10 years,” Coleman adds.